In 2017, The Germanisches Nationalmuseum (GNM) was able to acquire a remarkable object: a one-piece silk dress from the period around 1 760 with a hooped skirt from about the same time. The colours of the silk fabric are extremely well-preserved; the pale blue background with the colourful flower decoration has hardly faded at all – which is extremely rare in textiles from this period. 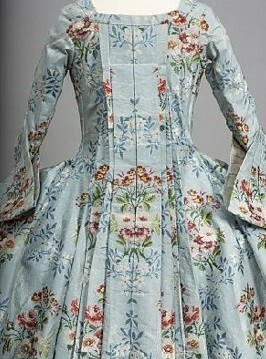 But what did one wear back then with a dress of this kind? In the exhibition, splendid jewellery, accessories and “fancies” such as headpieces and collars, fans and gloves, silk stockings and shoes complete the picture of a lady “à la mode”. Contemporary portrayals and excerpts from historical literature also give a deep insight into the enormous skill that went into making such elaborate clothing and accessories. With around 100 items on display, the exhibition offers a fascinating insight into luxury clothing of the 18th century and also examines various issues within historical textile and clothing research. The special exhibition is open and can be reviewed until January 6, 2019 in town Nuremberg, Germany.